SAML 2.0 Bearer Assertion Profile which is built on top of OAuth 2.0 Assertion Profile defines the use of a SAML 2.0 Bearer Assertion as a means for requesting an OAuth 2.0 access token as well as for use as a means of client authentication. The OAuth 2.0 Assertion Profile is an abstract extension to OAuth 2.0 that provides a general framework for the use of Assertions as client credentials and/or authorization grants with OAuth 2.0. 1. To define an extension grant type that uses a SAML 2.0 Bearer Assertion to request an OAuth 2.0 access token when a client wishes to utilize an existing trust relationship, expressed through the semantics of (and digital signature calculated over) the SAML Assertion, without a direct user approval step at the authorization server. 2. 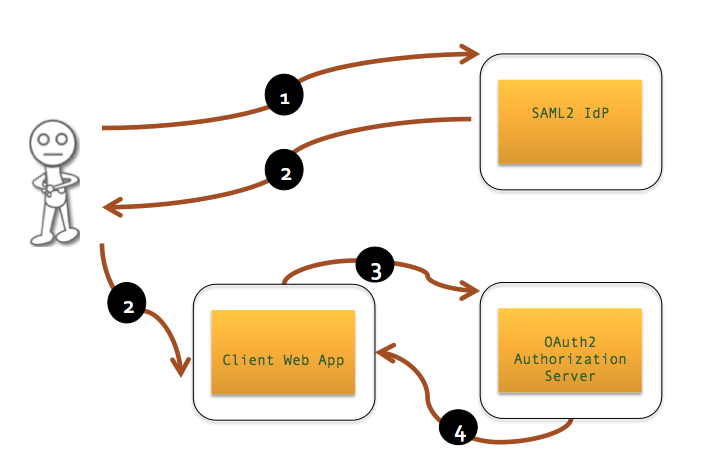 To define how a SAML Assertion can be used as a client authentication mechanism. The use of an Assertion for client authentication is orthogonal to and separable from using an Assertion as an authorization grant. They can be used either in combination or separately. This specification further defies the format and processing rules for the SAML Assertion are intentionally similar, though not identical, to those in the Web Browser SSO Profile defined in SAML Profiles. Now let's have a look at an end to end scenario which explains how to use SAML 2.0 Bearer Assertion as an grant type. 1. User been redirected to the SAML2 IdP and user authenticates to the SAML2 IdP. 2. SAML2 IdP issues a SAML2 Token with following characteristics and Client Web App verifies the SAML2 token and authenticates the user. The Assertion's Issuer element will contain a unique identifier for the entity that issued the Assertion - which is the SAML2 IdP in our case. The Assertion will contain Conditions element with an AudienceRestriction element with an Audience element containing a URI reference that identifies the Authorization Server. The Assertion will contain Conditions element with an AudienceRestriction element with an Audience element containing a URI reference that identifies the Client Web App, which is the SAML2 Service Provider and Client Web App must verify element. The Assertion MUST contain a Subject element. The subject MAY identify the resource owner for whom the access token is being requested. When using an Assertion as an authorization grant, the Subject SHOULD identify an authorized accessor for whom the access token is being requested (typically the resource owner, or an authorized delegate). The Assertion MUST have an expiry that limits the time window during which it can be used. The expiry can be expressed either as the NotOnOrAfter attribute of the Conditions element or as the NotOnOrAfter attribute of a suitable SubjectConfirmationData element. The element must contain at least on element that allows the authorization serve to confirm it as a Bearer Assertion. Such a element MUST have a Method attribute with a value of "urn:oasis:names:tc:SAML:2.0:cm:bearer". The SubjectConfirmation element MUST contain a SubjectConfirmationData element, unless the Assertion has a suitable NotOnOrAfter attribute on the Conditions element, in which case the SubjectConfirmationData element MAY be omitted. When present, the SubjectConfirmationData element MUST have a Recipient attribute with a value indicating the token endpoint URL of the authorization server (or an acceptable alias). The SubjectConfirmationData element MUST have a NotOnOrAfter attribute that limits the window during which the Assertion can be confirmed. The SubjectConfirmationData element MAY also contain an Address attribute limiting the client address from which the Assertion can be delivered. Verification of the Address is at the discretion of the authorization server. If the Assertion issuer authenticated the subject, the Assertion SHOULD contain a single AuthnStatement representing that authentication event. If the Assertion was issued with the intention that the presenter act autonomously on behalf of the subject, an AuthnStatement SHOULD NOT be included. The presenter SHOULD be identified in the NameID or similar element, the element, or by other available means. Other statements, in particular elements, MAY be included in the Assertion. 3. Now Client Web App wants to access a RESTful service which secured with OAuth 2.0 and it has to get an access token on behalf the logged in user first. Now using the SAML2 grant type, Client Web App Requests an access token from the OAuth 2.0 Authorization Server. 4. Authorization Server validates the SAML token assertion and issues an access token back. Authorization Server does the SAML token verification as mentioned below. The Assertion will contain Conditions element with an AudienceRestriction element with an Audience element containing a URI reference that identifies the Authorization Server and Authorization Server must verify the element. The SubjectConfirmation element MUST contain a element, unless the Assertion has a suitable NotOnOrAfter attribute on the Conditions element, in which case the SubjectConfirmationData element MAY be omitted. When present, the SubjectConfirmationData element MUST have a Recipient attribute with a value indicating the token endpoint URL of the authorization server (or an acceptable alias). The authorization server MUST verify that the value of the Recipient attribute matches the token endpoint URL (or an acceptable alias) to which the Assertion was delivered. The SubjectConfirmationData element MUST have a NotOnOrAfter attribute that limits the window during which the Assertion can be confirmed. The SubjectConfirmationData element MAY also contain an Address attribute limiting the client address from which the Assertion can be delivered. Verification of the Address is at the discretion of the authorization server. The authorization server MUST verify that the NotOnOrAfter instant has not passed, subject to allowable clock skew between systems. An invalid NotOnOrAfter instant on the Conditions element invalidates the entire Assertion. An invalid NotOnOrAfter instant on a SubjectConfirmationData element only invalidates the individual SubjectConfirmation . The authorization server MAY reject Assertions with a NotOnOrAfter instant that is unreasonably far in the future. The authorization server MAY ensure that Bearer Assertions are not replayed, by maintaining the set of used ID values for the length of time for which the Assertion would be considered valid based on the applicable NotOnOrAfter instant. 5. Now Client Web App can use the access token to access the secured service. Almost all the implementation I see today are based on OAuth 2.0 Bearer Token Profile. Of course its an RFC proposed standard today. OAuth 2.0 Bearer Token profile brings a simplified scheme for authentication. This specification describes how to use bearer tokens in HTTP requests to access OAuth 2.0 protected resources. Any party in possession of a bearer token (a "bearer") can use it to get access to the associated resources (without demonstrating possession of a cryptographic key). To prevent misuse, bearer tokens need to be protected from disclosure in storage and in transport. Before dig in to the OAuth 2.0 MAC profile lets have quick high-level overview of OAuth 2.0 message flow. OAuth 2.0 has mainly three phases. 1. Requesting an Authorization Grant. 2. Exchanging the Authorization Grant for an Access Token. 3. Access the resources with the Access Token. Where does the token type come in to action ? OAuth 2.0 core specification does not mandate any token type. At the same time at any point token requester - client - cannot decide which token type it needs. It's purely up to the Authorization Server to decide which token type to be returned in the Access Token response. So, the token type comes in to action in phase-2 when Authorization Server returning back the OAuth 2.0 Access Token. The access token type provides the client with the information required to successfully utilize the access token to make a protected resource request (along with type-specific attributes). The client must not use an access token if it does not understand the token type. Each access token type definition specifies the additional attributes (if any) sent to the client together with the "access_token" response parameter. It also defines the HTTP authentication method used to include the access token when making a protected resource request. For example following is what you get for Access Token response irrespective of which grant type you use. The above is for Bearer - following is for MAC. Here you can see MAC Access Token response has two additional attributes. mac_key and the mac_algorithm. Let me rephrase this - "Each access token type definition specifies the additional attributes (if any) sent to the client together with the "access_token" response parameter". This MAC Token Profile defines the HTTP MAC access authentication scheme, providing a method for making authenticated HTTP requests with partial cryptographic verification of the request, covering the HTTP method, request URI, and host. In the above response access_token is the MAC key identifier. Unlike in Bearer, MAC token profile never passes it's top secret over the wire. The access_token or the MAC key identifier is a string identifying the MAC key used to calculate the request MAC. The string is usually opaque to the client. The server typically assigns a specific scope and lifetime to each set of MAC credentials. The identifier may denote a unique value used to retrieve the authorization information (e.g. from a database), or self-contain the authorization information in a verifiable manner (i.e. a string consisting of some data and a signature). The mac_key is a shared symmetric secret used as the MAC algorithm key. The server will not reissue a previously issued MAC key and MAC key identifier combination. Now let's see what happens in phase-3. Following shows how the Authorization HTTP header looks like when Bearer Token been used. This adds very low overhead on client side. It simply needs to pass the exact access_token it got from the Authorization Server in phase-2. Under MAC token profile, this is how it looks like. This needs bit more attention. id is the MAC key identifier or the access_token from the phase-2. ts the request timestamp. The value is a positive integer set by the client when making each request to the number of seconds elapsed from a fixed point in time (e.g. January 1, 1970 00:00:00 GMT). This value is unique across all requests with the same timestamp and MAC key identifier combination. nonce is a unique string generated by the client. The value is unique across all requests with the same timestamp and MAC key identifier combination. The client uses the MAC algorithm and the MAC key to calculate the request mac. This is how you derive the normalized string to generate the HMAC. The normalized request string is a consistent, reproducible concatenation of several of the HTTP request elements into a single string. By normalizing the request into a reproducible string, the client and server can both calculate the request MAC over the exact same value. 1. The timestamp value calculated for the request. 2. The nonce value generated for the request. 3. The HTTP request method in upper case. For example: "HEAD", "GET", "POST", etc. 4. The HTTP request-URI as defined by [RFC2616] section 5.1.2. 5. The hostname included in the HTTP request using the "Host" request header field in lower case. 6. The port as included in the HTTP request using the "Host" request header field. If the header field does not include a port, the default value for the scheme MUST be used (e.g. 80 for HTTP and 443 for HTTPS). 7. The value of the "ext" "Authorization" request header field attribute if one was included in the request (this is optional), otherwise, an empty string. Each element is followed by a new line character (%x0A) including the last element and even when an element value is an empty string. Either you use Bearer of MAC - the end user or the resource owner is identified using the access_token. Authorization, throttling, monitoring or any other quality of service operations can be carried out against the access_token irrespective of which token profile you use. This Blog Is Not Updated Any More. Check out my new blog on Medium!